Reference number for this case: 16-Oct-54-Paramé. Thank you for including this reference number in any correspondence with me regarding this case. Luc Chastan indicates that in the Ille and Vilaine in Paramé on October 16, 1954 at 19:45 hours "A witness observed two luminous discs which went up and went down in the sky at an extraordinary speed. A third disc seemed to follow less quickly a line parallel in the horizon. One trail was visible for each disc like a comet tail." The source is noted "Le Provençal". The website indicates that on 16 October 1954 at 19:45 in "Parame, France", "Unusual objects were sighted, that had unconventional appearance and performance. Three objects were observed." The soiurce is noted as "Vallee, Jacques, Computerized Catalog (N = 3073)". Not looked for yet. Probable jet planes. 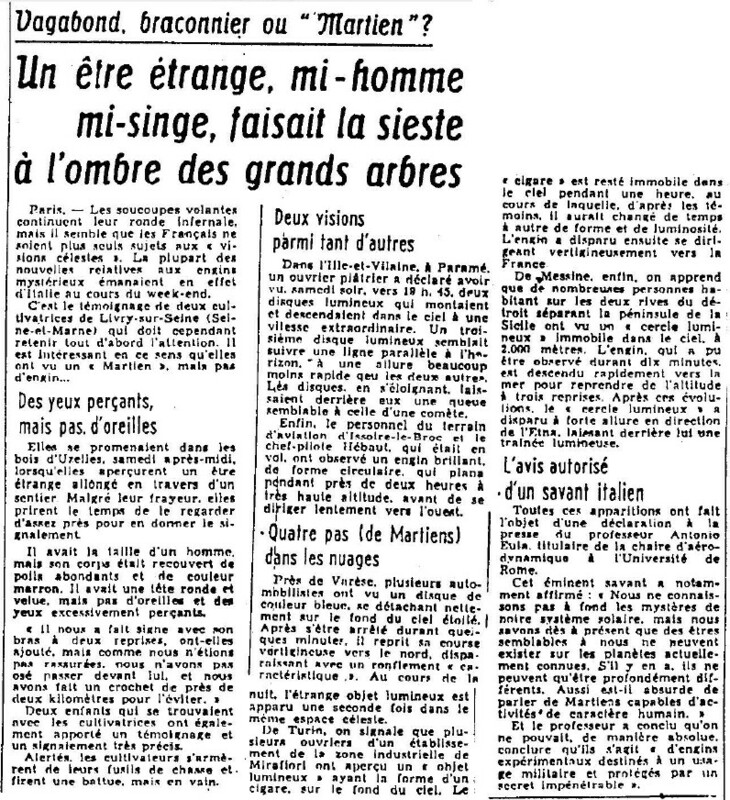 [lp1] Article in the regional newspaper Le Provençal, Marseilles France, page 8, October 18, 1954. 1.0 Patrick Gross December 28, 2009 Conversion from HTML to XHTML Strict. First formal version. Additions [lc1], [ud1]. 1.2 Patrick Gross March 1, 2017 Addition [ub1]. This page was last updated on March 1, 2017.